Ariel Tidhar was born and raised in Chicago in an American-Israeli family. She grew up being sent to school with a packed lunch of pita & hummus with tiny Israeli pickled eggplant on the side. She has vivid memories of being infatuated by the arts and being in art and sewing classes from a young age. In her 5th grade yearbook, students were asked to list what they wanted to be when they grew up, and under Ariel’s name it said “future fashion designer.” Born in a lineage of fashion creatives, including a mother who studied fashion design and a grandmother who was a seamstress, it was no surprise that Ariel went on to study fashion design after high school. 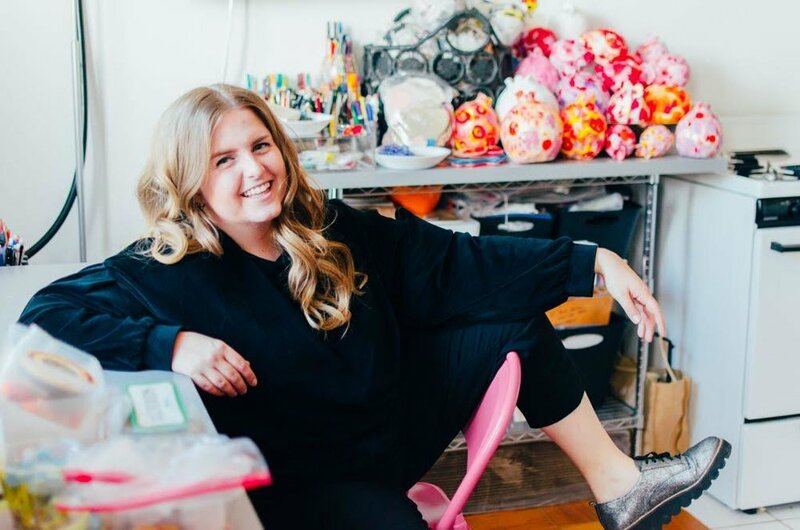 Ariel graduated in May 2016 from Pratt Institute in Brooklyn, NY with a Bachelors of Fine Art in Fashion Design. During her time at Pratt, Ariel fell in love with textile, embellishment, and color. Her work has evolved to combine a sprinkle of Jewish humor as well as nostalgic references that honor her Israeli roots. She uses hand-craft as a way to lessen the divide between art and fashion. During her time in college and since graduation, Ariel has developed a set of skills that combines fine art and fashion construction. She continues to enhance and use these methods in her present work. In recent years, Ariel’s work has expanded to include modern Judaica pieces, home décor, and accessories. Currently based in Brooklyn, NY, Ariel is available for freelance and custom work upon request. Contact her via email at ariel@arieltidhar.com or use the form below.